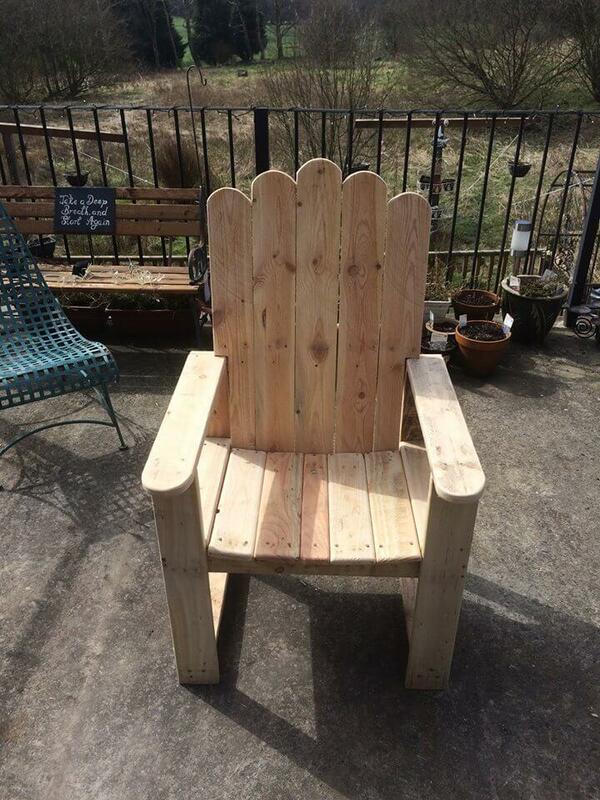 It’s time to amuse your inner outdoor-addicted person more, enjoy this free yet super sturdy Adirondack chair design! Super stable, visually attractive and comfortable design is waiting for you to enjoy the adorable outdoor and lovely space scenes over the mountain peaks! Build this friendly and gorgeous layout of this painted DIY pallet Adirondack chair for your green space to add focal stimulation. While sitting on this outdoor chair design, you will feel the same like swinging a hammock or enjoying a rocking chair! 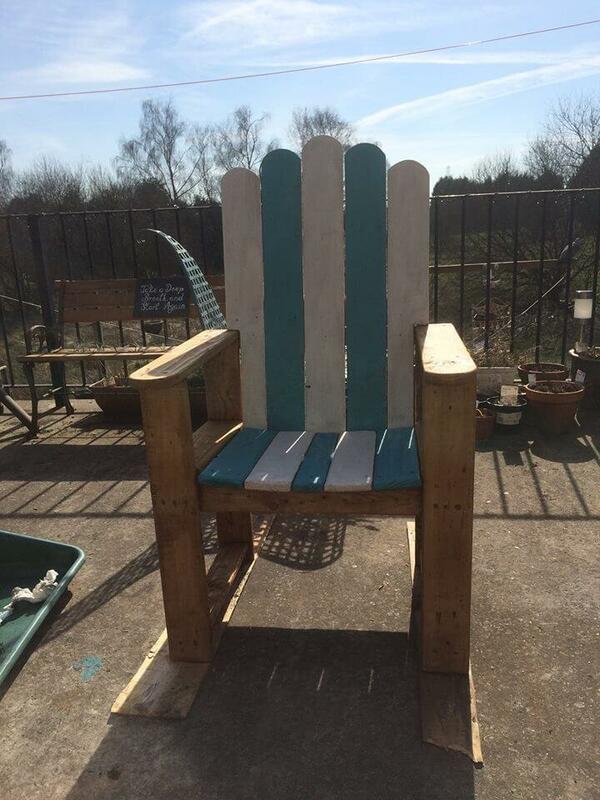 Pallets have beautifully been reconfigured, restyled and refinished to construct this chair having out of ordinary design! Royal backrest of the chair is enough to make your feel like a king and has been painted in white and blue for an outdoor and beach friendly look! In addition, it comes with armrests to make you feel more secure and comfortable! Chair is perfect used at any area surrounded with greenery and mountain if possible, otherwise you can use it on terrace, rooftops, at backyard, on your paved outdoors and in residential park areas! 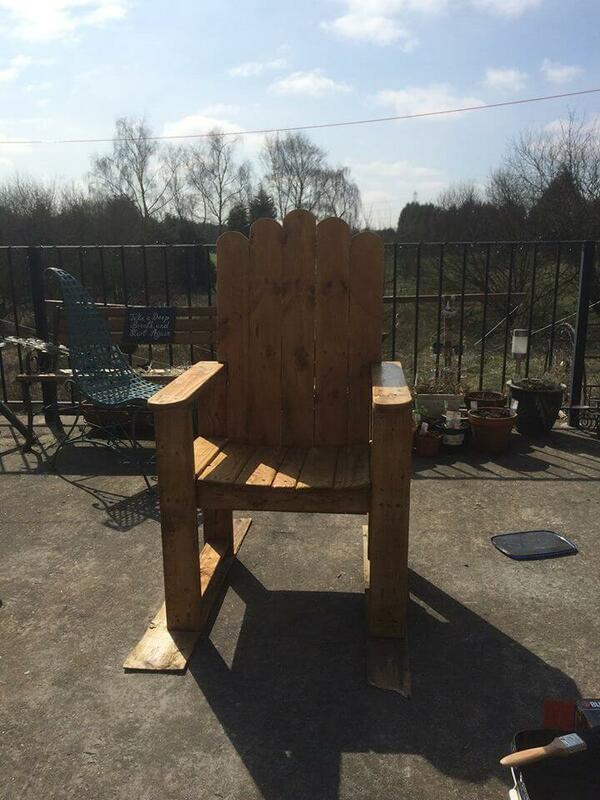 Construction is really simple and a little bit different from the ordinary Adirondack chair mass produced! It does have the bent rear or reclining back! Berth section is the simple just like that of ordinary chairs! Build separately the berth, backrest and two squared shapes to serve as flat legs and armrests! Join and backrest to berth through a convenient angle for a comfortable slope! Fit this L-shape just at the mid level of the wooden box and enjoy and sophisticated Adirondack chair! Paint would be awesome choice to create the reference look of the chair! In this case, only the berth and backrest positions have been painted in while and blue for a beach inspired and patio friendly appearance! Varnish, stain and polyurethane are also the perfect choices to change the wood tone to any with arresting luster and shine on the wood grains! Stain and sealant treatment, can make the wood live longer without getting affected by the bad weather!